Climate change is a challenge with which our generation and each following generation must grapple. Understanding the causes, effects, and risks and developing the skills for responding to global change is a major challenge of the 21st century that requires coordinated contributions from the sciences, social sciences, humanities, arts, and beyond. 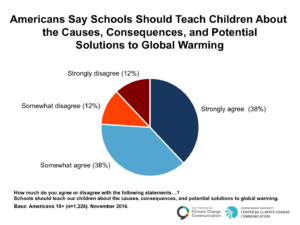 There have been many effective efforts to implement climate change education, awareness, and engagement programs focused on a multitude of audiences and topics and in multiple regions. Work by Yale University and George Mason University found in their “Climate Change in the American Mind” report series shows that public understanding of climate change fundamentals – that it is happening, is human caused, and will have serious consequences for human societies and natural ecosystems here in the United States and around the world – has been stubbornly stable even as scientific certainty and concern regarding climate change has grown significantly. 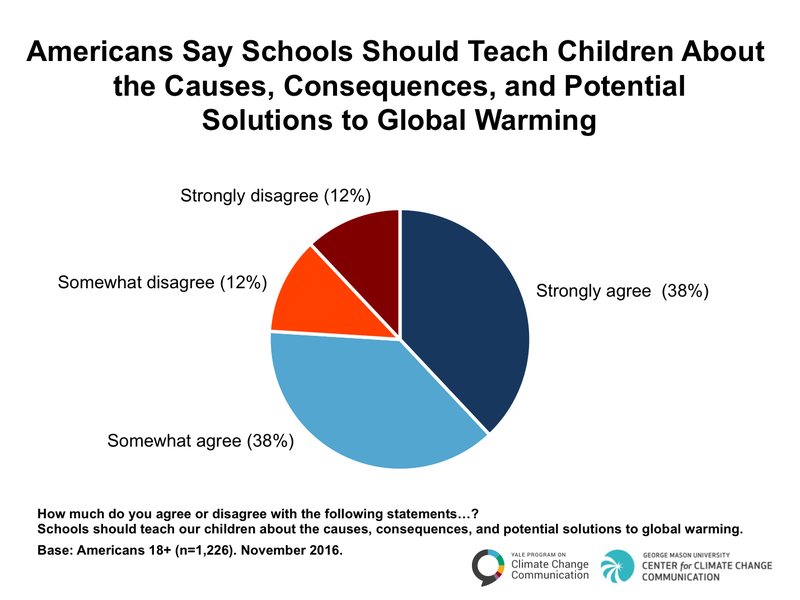 These findings underscore the critical need for more and improved climate change education. Educational scholars, researchers, and program leads are observing growing trends with youth that they anticipate will only grow stronger with time. Students are demanding to know more about climate change and what they can do about it. One way this can be seen is in the increasing number of specialized, interdisciplinary degrees and programs being offered by colleges and universities across the country and the world. According to the National Council for Science and the Environment, 842 colleges and universities in the U.S. offer interdisciplinary environmental and sustainability programs, a 29% increase in just four years. With the threat of global climate change and the global energy crisis, cities, states, and corporations here in the United States and around the world are realizing the need to use more renewable energies to produce our electricity and fuel our vehicles. As the need has dramatically increased, the renewable energy field has experienced great growth. 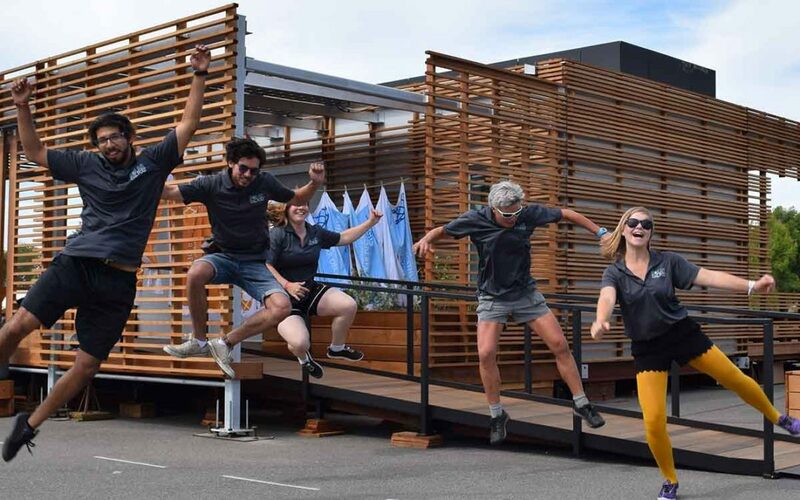 The recent NOW HIRING: The Growth of America’s Clean Energy & Sustainability Jobs report by the Environmental Defense Fund’s Climate Corps finds that transitioning to a more environmentally sustainable and energy-efficient economy can create jobs. American K-12 education systems and community colleges have the potential to equip their graduates with the skills necessary to fulfill well-paying jobs that have the added benefit of creating the clean energy economy and strengthening communities. The scientific community has made the urgent need to mitigate climate change clear, and with the ratification of the Paris Agreement on Climate Change under the United Nations Framework Convention on Climate Change the international community has formally accepted ambitious mitigation goals. Additionally, cities around the world and across the United States are leading the way to ambitiously exceed the 2015 Paris Agreement goals. However, a formidable gap remains between the aspirational emissions reduction goals of the Paris Agreement and the real-world pledges and actions of nations that are party to it. Closing the emissions and resilience gap can only be achieved if a similarly wide gap between scientific and societal knowledge of climate change is also closed. Several fundamental aspects of climate change make both the need for education and the opportunity it offers clear. First, addressing climate change will require action at all levels of society including individuals; organizations; businesses; local, state, and national governments; and international bodies. It is not a problem that can be addressed by a few individuals with privileged access to information but rather one that will require transfer of knowledge, both intellectually and affectively, to decision-makers and their constituents at all levels. Secondly, because of inertia in the climate and human energy systems, decisions and actions taken immediately will have consequences that unfold over decades to centuries or longer. Climate and energy sciences are rapidly evolving with respect to both knowledge and available technology. At the same time, citizens of all ages need accurate, up-to-date information, knowledge of the sciences, and analytical skills to make responsible decisions and long-term plans regarding these challenging topics. 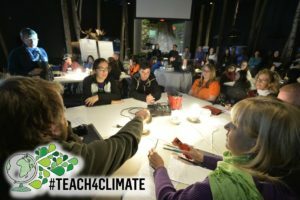 The hope is that, if educators can effectively teach the nuance and complexity of climate change and its solutions, the gains will bolster larger efforts to improve science education overall, aiding literacy and critical thinking. is able to make informed and responsible decisions with regard to actions that may affect climate. The guide goes on to describe how becoming literate in climate science contributes to science literacy and is an ongoing learning process. The Tri-Agency Climate Education (TrACE) Collaborative between the National Aeronautics and Space Administration (NASA), National Oceanic and Atmospheric Administration (NOAA), and National Science Foundation (NSF) built on the climate literacy guide through supporting robust education and communication initiatives to develop a climate-literate citizenry and skilled workforce. The effort needed for comprehensive climate change education is far greater than any one institution, education sector, or even federal agency can handle. Throughout the United States, numerous federal, state, and local agencies; non-governmental organizations; professional societies; and individuals are focused on developing and evolving the use of climate education tools. Within this diverse group, NASA, NOAA, and NSF have collaborated since 2009 to coordinate over $110 million of their investments in roughly 125 climate change education projects. 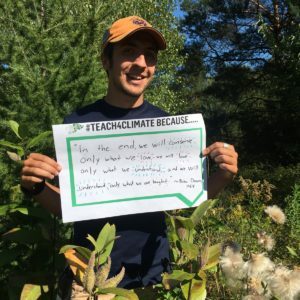 Additionally, numerous other programs and efforts have been developed to support and inspire teachers, students, and citizens like the Alliance for Climate Education, Climate Generation, and the Higher Education Climate Leadership Network, to name a few. Increasing climate and energy literacy requires a shared effort by the scientific and technical communities and the education and outreach communities. In 2008, the Climate Literacy and Energy Awareness Network (CLEAN) brought together individuals and communities to collaboratively contribute to increasing climate and energy literacy. CLEAN has two components accessible through its portal. The first provides resources for educators, including the CLEAN Collection—a collection of rigorously vetted educational resources; pedagogical support pages with teaching strategies and tips; and recorded presentations by climate, energy, and education experts. The second is the CLEAN Network—a community of professionals, partners, educators, resource developers, and other stakeholders committed to climate and energy literacy. The CLEAN Collection includes more than 660 resources—activities, videos, visualizations, and short demonstrations and experiments—culled from more than 20,000 online educational resources that address both the climate and energy literacy guides. These resources were reviewed for scientific accuracy, pedagogical effectiveness, and technical quality by a panel of educators and scientists and, separately, by expert scientists. The breadth of interdisciplinary topics in the fields of climate and energy requires many expert scientists to conduct rigorous reviews, and CLEAN has engaged more than 250 scientists and educators in this process thus far. Resources that pass review are aligned with science education standards (including Next Generation Science Standards), tagged with metadata, and published with annotations from the review process. CLEAN also provides pedagogical support pages for teaching climate and energy. These outline the common misconceptions and challenges of teaching these topics and suggest effective classroom approaches. The quality of the CLEAN Collection makes it a reliable resource. A critical part of teaching climate change and its solutions is to build teachers’ comfort, confidence, and competence to bring the issue into their educational setting. Here are a few programs that can benefit teachers. Learning how to teach climate change in an inter- or transdisciplinary way requires time and support from a community of practice. 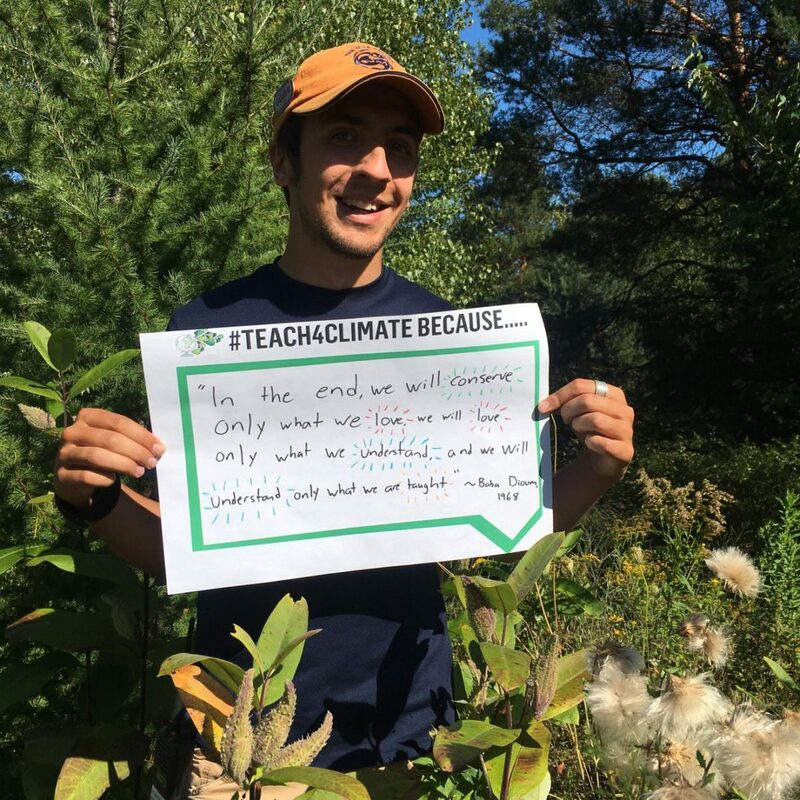 To help, the NOAA Climate Stewards Education Project provides formal and informal educators working with elementary through university age students with sustained professional development, collaborative tools, and support to build a climate-literate public actively engaged in climate stewardship. For ten years, Climate Generation has been building the climate literacy and confidence of educators through professional development opportunities. They plan their professional development opportunities to demonstrate to educators how climate change fits with their academic standards, building their knowledge in climate science and their skills in climate change education and developing their abilities to deal with adversity. The 12th Annual Summer Institute for Climate Change Education is coming up June 26-28. Enhance your knowledge of Earth system science and earn free graduate credit through AMS Education’s teacher professional development programs. Over 20,000 teachers have boosted their STEM curriculum and impacted millions of students across the nation through these initiatives. The NOAA supported DataStreme Program provides teachers a 13-week long course in weather, ocean, or climate fundamentals through a distance-learning course emphasizing the study of Earth system science as it happens and offering ways to instill the excitement of real-world information across your science curriculum. Specialized majors and degrees, engaging student summits, and related teacher focused programs and opportunities for climate literacy are furthering our ability to build a climate-smart nation that supports American progress toward economic prosperity through clean sustainable energy and resilience to extreme events so communities can bounce back more quickly and recover more fully. It is our generation’s duty to be responsive to the needs of our youth and provide the learning opportunities they need to help devise solutions that benefit us all. Frank Niepold is the Climate Education Coordinator at NOAA’s Climate Program Office in Silver Spring Maryland; Climate.gov Education section lead; a co-chair of the U.S. Global Change Research Program’s (U.S. GCRP) Education Interagency Working Group; the U.S. Climate Action Report Education, Training, and Outreach chapter lead; and a member of the Federal Steering Committee for the Fourth National Climate Assessment. Additionally, he is the managing lead of the U.S. GCRP document Climate Literacy: The Essential Principles of Climate Science, a founding member of the CLEAN Network, and a former Co-PI for the NSF Funded CLEAN Pathway project that led to the CLEAN Collection.